Hope all is well. Not fun to experience. Went to the dentist today. Had a little blister looking thing over a tooth but didn't hurt. I suspected a leaky root and (drum roll please)........I was correct. This was a tooth that had a root canal years ago and had a root amputation 2-3 years ago. So an implant is in the picture. This will be my third. I know it is stressful waiting for the results. I hope it turns out to be nothing. Hey, you only have two now? Gee, I have five dental implants and a bridge. Plus there's another one that is slightly "iffy" so I expect may need a sixth implant in the next year or so. You're not a loser, you're a winner! Love my dental implants, even though they are lengthy and expensive. They feel so natural and nicely functional. Sure beats being toothless. Hoping for the best outcome, Khan. Let us know. Sitting with DW in the ER. After a month long extreme headache she said take me somewhere, anywhere. She sees a Nuerologist assistant next week but the pain is intolerable. She's been begging me to put a bullet in her head. I'm doubtful they'll treat her pain appropriately. Seems like 2019 is the year to go suffer! Sure enough they're giving her the same NSAID that didn't work two weeks ago. Oxygen as well, she's been using it every day at home too, it does very little. The doctor thinks this is a cluster headache. I'm not sure one way or another. I used to get cluster headaches frequently but my symptoms and progression were very different. About the only thing that is common is the pain around her eyes. So she came in with a monster headache and will leave with a monster headache. What a great way to treat people! At least they didn't give her any nasty opiods that would reduce her pain. ETA: After both of us nicely complaining about her pain levels at discharge they did give her some IV Dilaudid. Last time, three years ago, it knocked the headache out. Day two in the ER..This time DW was lucky to find a doctor who refuses to use narcotics for cluster headaches. How lovely. He manages his clusters without, so no need for you to have any. He has shown her a visualization technique to help her ignore her pain. He's a very entertaining man, however she's really not in humor to appreciate a doctor whose technique seems to be live with it. They're giving her the same meds that didn't work yesterday..
Now it's time for some ketamine. Great, maybe she'll start tripping on it. He's in her encouraging her to meditate on the ketamine. Pretty sure there's some incense burning too. It's a powerful drug, she's only partially here now. Laughing, says she's floating, I guess that's better than screaming in pain. He's thinking she will be discharged soon, I guess the magic mushrooms are off the menu. Went to see Bohemian Rhapsody yesterday. I wasn’t a big fan back in the day but thoroughly enjoyed the music and the film. Hoping for good results for you. Sounds like a very miserable experience. Sure hope the neurologist is able to help. So sorry your wife is going through this. Made up a couple of big plates of spaghetti for DW and me. Looks like the snow is about stopping so I'm going to go out and play with the snow blower. Maybe photos later. That sounds awful. I sure hope she gets some relief soon. The kids came up Thursday afternoon. We were supposed to go skiing today. They had both had a cold during the week but felt better Thursday. This morning they both took a turn for worse so no skiing. Yesterday I met them on the road as they were coming out and I was on my way to a Board meeting. This morning when they were not feeling good I thought it best that I just go to town and run errands while they got some extra sleep and rest. I finally got to spend some time with them this evening, but they were ready to turn in again quite early. I hope they feel better tomorrow, but I'm also glad they can get some rest when they come up here to the mountains. Had a visit from the cable guy this morning. Last week, our tv picture started pixelating to various degrees depending on channel and time of day. A call to Verizon Fios, where the lady on the phone said that her tests said we had a S/N problem and it looked like we had a bad splitter. So DH and I did some trouble shooting. Took the splitter out of the equation and connected the family room tv directly, bad picture. Connected the bedroom tv directly, bad picture. DH called Verizon again, this time they insisted that it wasn’t the splitter but probably the coax in our house. They could send a tech, it would be $99 to show up and then hourly if the problem was ours. The tech showed up this morning, took one look at the picture quality on the tv and said it was a problem with the Verizon equipment on the outside of our house. Went out, replaced a box and some wires, and our picture is fine. I found it funny that the people doing the remote testing insisted that the problem was with our infrastructure, but the tech knew right away that the problem was Verizon’s. "Blame the victim" appears to be a key strategy in many courtrooms and customer service centers. Thanks. She saw her PCP yesterday who gave her some hydrocodone, it's not a good med for cluster headaches, but this morning her headache is much improved. I'd also stopped at a local rec dispensary and bought a couple of CBD products. Not sure what helped and I don't really care. Today the pharmacy is supposed to have nasal imitrex in. I've read it's a great med for cluster headaches. She has a appointment with an assistant neurologist in Durango Monday morning. There's some weather heading this way, hopefully we can get there. Not worried about traction but some forecasts are calling for 8-16" of snow and 50mph winds. With a headache as bad as hers has apparently been, I'm surprised that you aren't driving there before the snowfall and staying in a nearby motel within walking distance. Sounds like it could be worth the cost if the headache intensifies again (unless they cancel her appointment). But then, I don't live in snow country so I don't know much about dealing with snowstorms. Thank you for a good idea. We're watching the weather forecast and trying to plan out the trip. Given how ill DW has been I'm letting her make all the decisions. Of course there's always a chance something will be canceled. I had a specialist appointment last storm and they rescheduled everyone from morning to afternoon or to the next month. Today we actually went out for lunch. First time in a week. It's nice to see her smile and feeling a lot better. Today is a rainy day, good for staying inside to eat some hot soup. 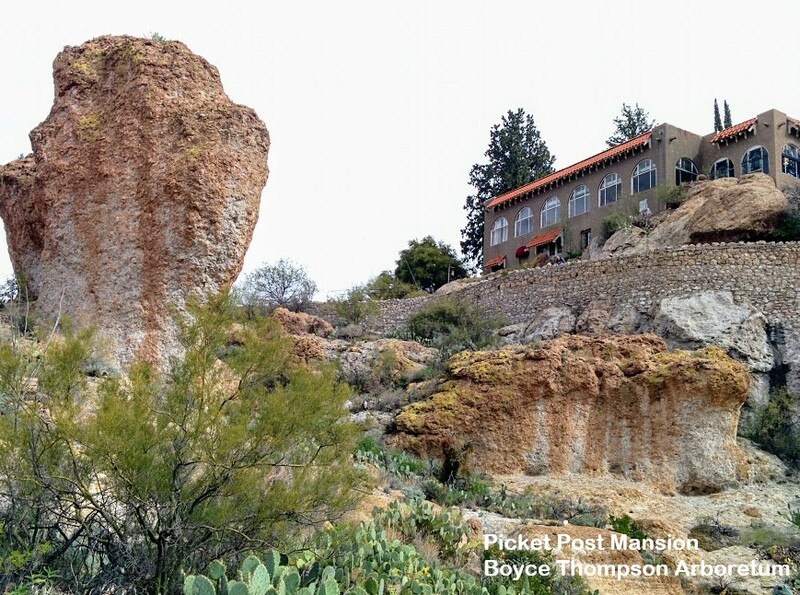 Yesterday, the weather was partially cloudy and cool, perfect for a family outing that my children arranged for a light hike through Boyce Thompson Arboretum. It is less than 1 hour drive from town, and they opened the Picket Post Mansion to the public only 2 days of the year. Today would not be good for a visit, and people knew that, so yesterday it was crowded with snowbirds in the area. Later yesterday, we took my mother, son, daughter, and son-in-law to an Italian restaurant to celebrate our 39th wedding anniversary. What a good day! Life cannot be much better than this, even if one spends more money. Good move on the spaghetti. Snow removal work needs a lot more calories than a salad can provide, no matter how big it is. Yesterday, dinner with DS. Today will be dinner with DD, DSiL.